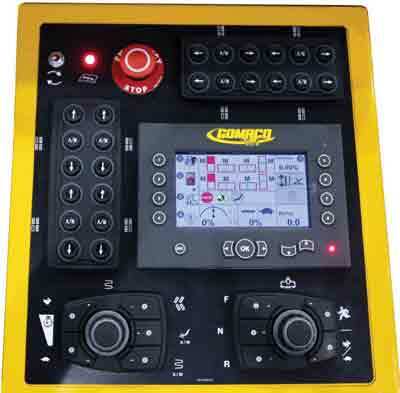 GOMACO’s proprietary and exclusive G+ control system is known in the industry for its operator-friendly software and controls, its diagnostic abilities, and its versatility. As the control system continues to evolve, new features have become available to GOMACO contractors. The latest innovation is the new G+ remote control for hands-on machine control at all times. The new remote can be used with any GOMACO three-track curb and gutter machine currently equipped with the G+ operating system. The new G+ remote control features a 4.3 inch (109 mm) graphic display screen that shows the run functions of the machine, the same information that is normally viewed at the operator’s console on top of the paver. Most paver functions are included on the remote and are controlled with easy to operate and durable dials or switches. It also gives the operator individual control of each leg of the paver with automatic/manual adjustments for elevation and steering. The lightweight remote control allows the operator to comfortably work from the operator’s platform or from the ground, giving them ultimate freedom to move around the machine for the best view of the paving operation. The exclusive G+ remote control allows hands-on safety at all times. It has an emergency stop button and an alert horn on the remote that are always within reach for quick access. The remote control is equipped with two lithium-ion batteries and a 12-volt charger. An optional AC adaptor is also available for purchase. For more information about the proprietary and exclusive G+ remote control, visit www.gomaco.com/remote. GOMACO’s G+ control system features simple machine operation, fast machine response, pinpointed troubleshooting and a fault history. Its 6.5 inch (165 mm) anti-glare display screen provides a full color display to illustrate the various aspects of the paver for set up and operation. G+ expresses itself in easy to understand international icons and full script explanations. It operates in all the major languages of the world and in the imperial or metric system. It has a lightning-fast processing speed with two-way communication between paver accessories and G+. Its instant digital feedback and closed-loop electronic and hydraulic control create a smooth, efficient and accurate concrete paving experience. GOMACO’s G+ control system has been proven on projects all around the world.